The bright yellow roadside flowers of Coltsfoot, Tussilago farfara, have long faded away for another year. 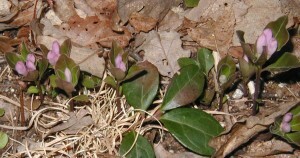 This Spring Coltsfoot bloomed during the last two weeks of March and the first week of April in South-Central Pennsylvania. 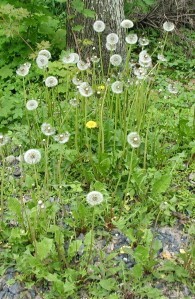 The yellow composite flowers remind one of dandelions, and so do the seed heads. After the flowers are visited by their pollinators the flowers produce their seeds in round heads, just like a dandelion, although the seed heads may be more compact in shape and not quite as round. 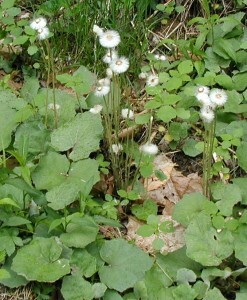 Dandelion-like seed heads of coltsfoot flowers. The fluffy seed head will stand easily a foot tall, so they are usually taller than dandelion seed heads that so many people hate to see in their lawns. The hoof-shaped leaves of Coltsfoot will continue to grow throughout the spring and summer until they are quite large, even larger than your hand. Coltsfoot seed head and leaves. 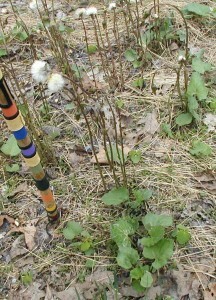 Seed heads and leaves of Coltsfoot. 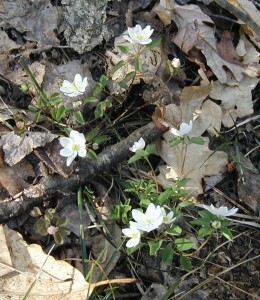 Photo taken 2May2010. Dandelion seed head and leaves. Dandelion seed heads are completely spherical and their jagged leaves are easy to spot. 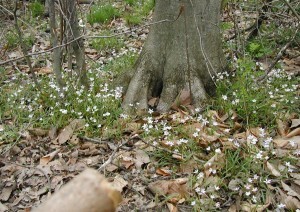 Photo taken 2May2010. Because they have very different leaf shapes no one should mistake dandelion for coltsfoot should they be interested in collecting seeds for their own dispersal. 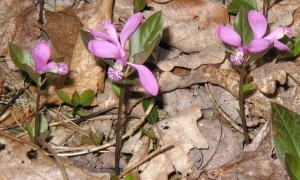 Pussytoes are common roadside flowers. 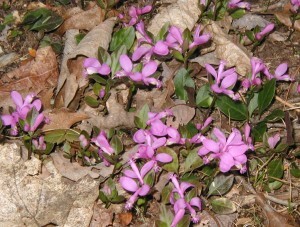 To find them look along ditches or hillsides next to the road, or open areas in the woods. If you look for them, you’ll most likely find some as they tend to form mats. 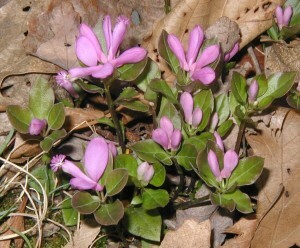 Flowering pussytoes are quite common in mid-Spring to Summer. 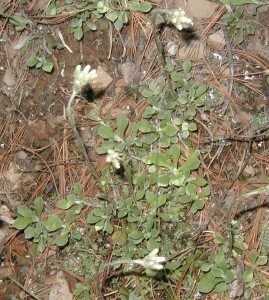 Several species of pussytoes, or everlastings as they may be called, are native to the Eastern US. 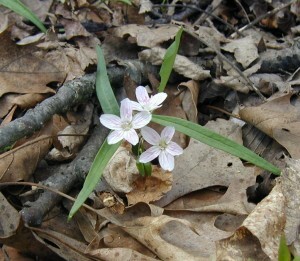 Pussytoes are differentiated by their leaf structure and leaf arrangement. 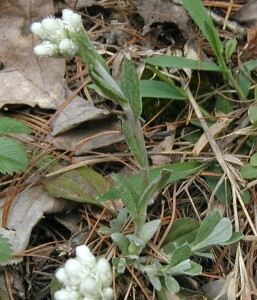 Our example here is called Smaller Pussytoes, Antennaria neodioica. 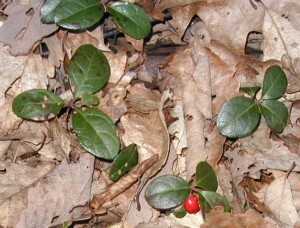 Its characteristics include the presence of one prominent vein instead of three veins in the basal leaves, and basal leaf shoots that are not long and prostrate. Also, the basal leaves turn upward at the tips which come abruptly to a point. 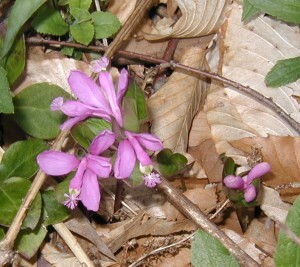 Blooming pussytoes with lance-like stem leaves. 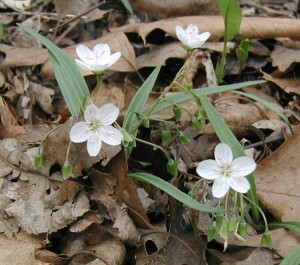 A very similar plant, Field Pussytoes, A. neglecta, has one-veined, spoon-shaped basal leaves that do not come to a point and longer basal leaf shoots that lie prostrate. 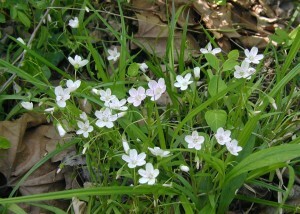 Newcomb’s Wildflower Guide provides line drawings and descriptions that help to differentiate several pussytoes. 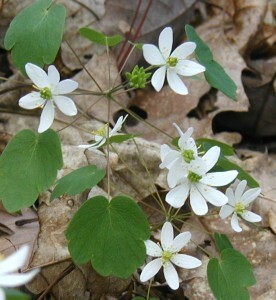 The flower parts are indistinguishable and comprised solely of disc flowers. 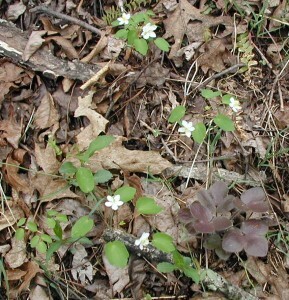 Ray flowers are not present in this member of the Compositae, the composite or daisy family. 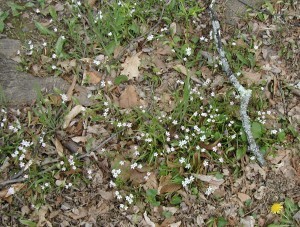 The small white flowering head appears fuzzy or woolly, as do the leaves and stems. Pussytoes cluster their flowers at the top of a woolly stem that might reach 6 to 12 inches tall. 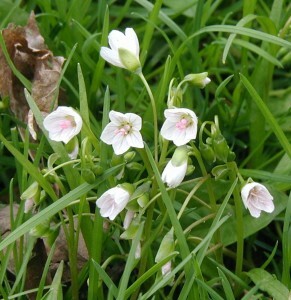 Six to eight composite flowers are very bright white. 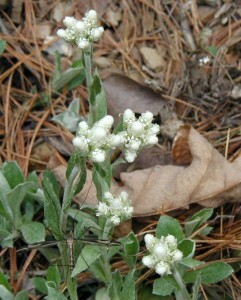 Flower heads of smaller pussytoes. 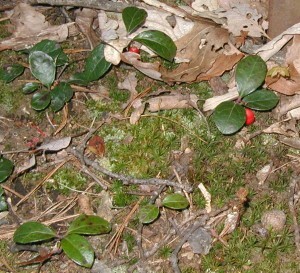 Small leaves on the stem are lance-like and are held close to the stem. 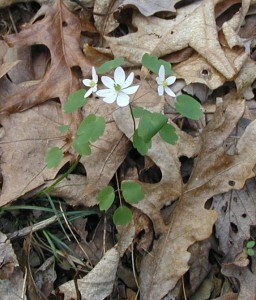 Basal leaves are somewhat larger than the stem leaves and have a broad tip that makes the basal leaf spoon-shaped. 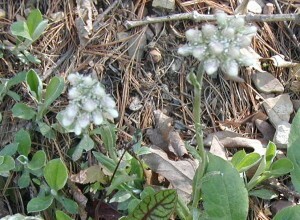 The common name pussytoes is fitting as the flowers do look like pussycat toes and the flowers clustered together remind one of a cat’s paw. 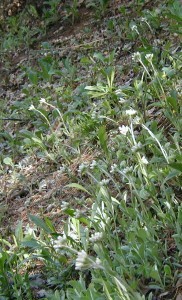 Sometimes the pussytoes have a dozen or more flower heads clustered together. Large clusters of pussytoes flower heads. Pussytoes blooming along the roadside. 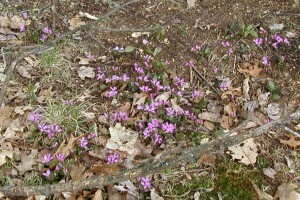 Pussytoes will continue to be seen flowering at the edge of the road or forest for weeks to come. 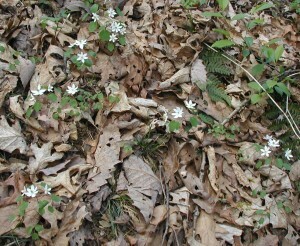 They have an ability to form mats, where several plants grow densely in a small area. Basal leaves growing closely together show the ability to form mats.